Hello, my wonderful friends. Can you believe the weekend is almost here? This week flew by and I am really looking forward to the weekend. 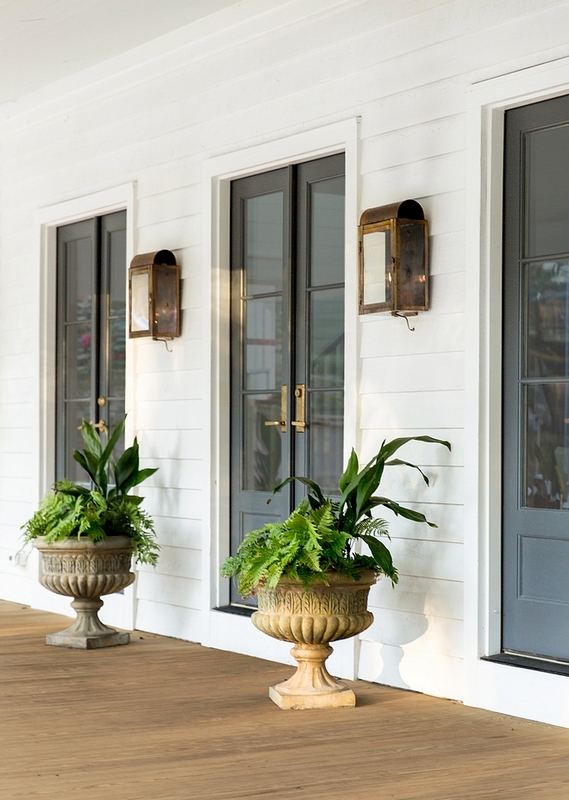 I need to find a quiet spot to recharge and it surely could be the front porch of this home we’ll be seeing today on our “Interior Design Ideas” series. 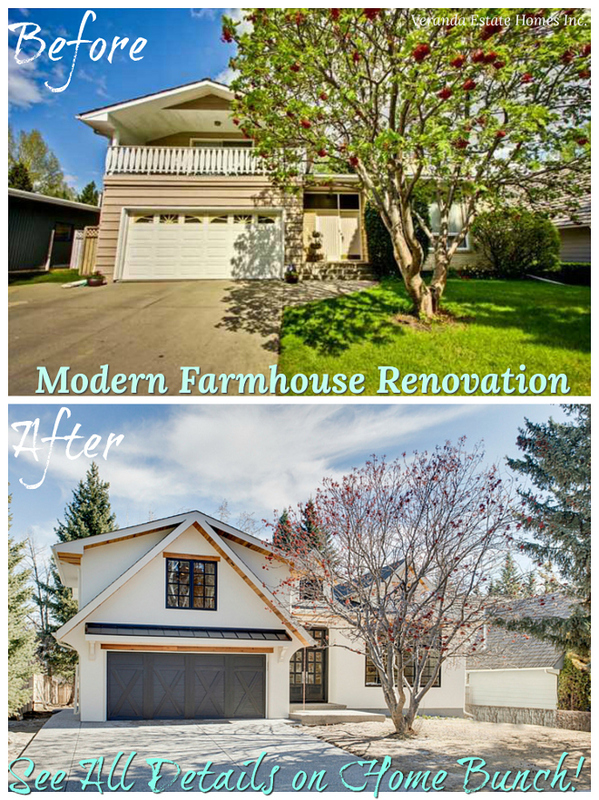 This home was built in the 60’s and the builder, Barrow Building Group, recently added 1500 square feet to it. The house was in a very bad shape and all of the interiors felt dark and closed-in, which is typical of that time. 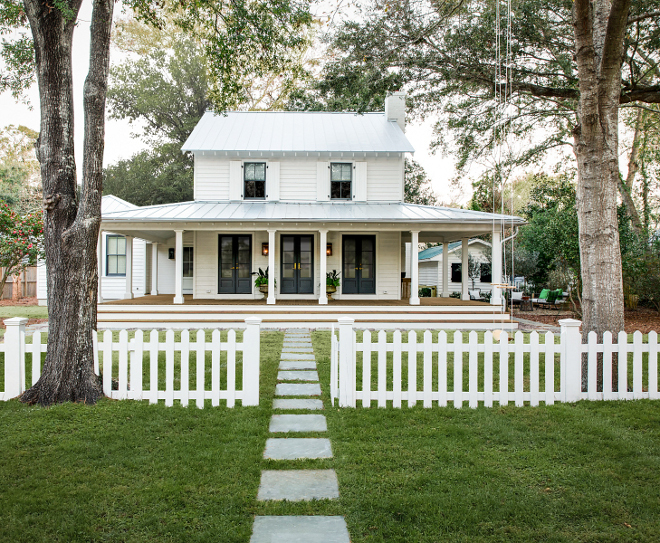 After going through a full inside and out renovation, this Lowcountry farmhouse now features an open layout with modern finishes and many inspiring ideas. 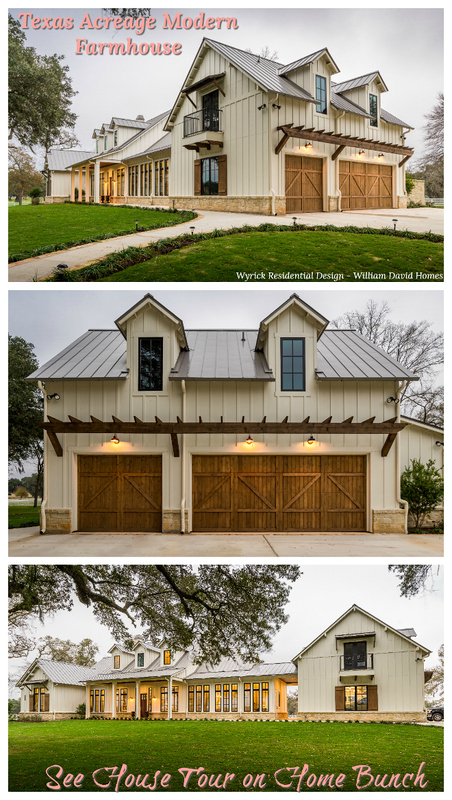 I fell in love with this home the moment the builder sent it to me. Isn’t it one of the most beautiful homes you have ever seen? Notice the wrap-around porch and the tree with a swing! Siding paint color is Sherman Williams Snowbound. Metal Roof: Galvalume standing seam roof. The windows are Sierra Pacific Windows in Battleship Grey. 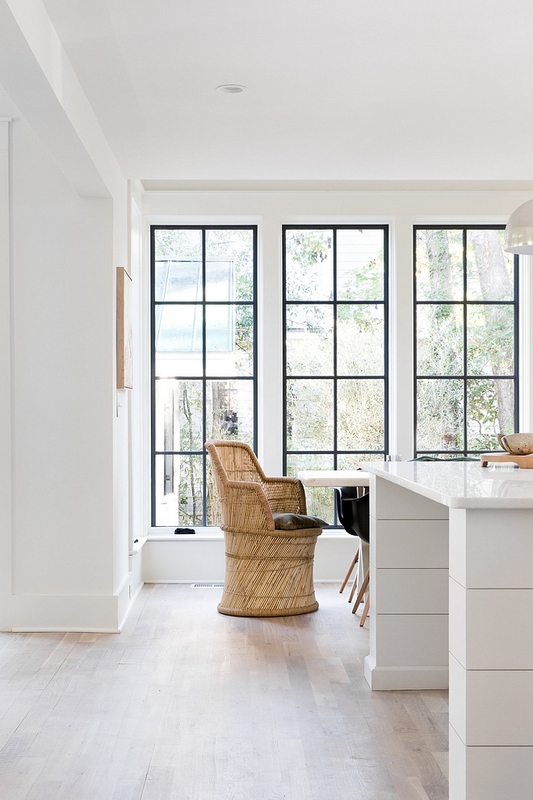 The builder created a custom formula for the French doors to match the same grey as the windows. 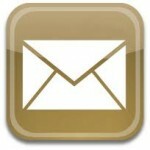 Door Hardware: Emtek in lacquered brass finish. 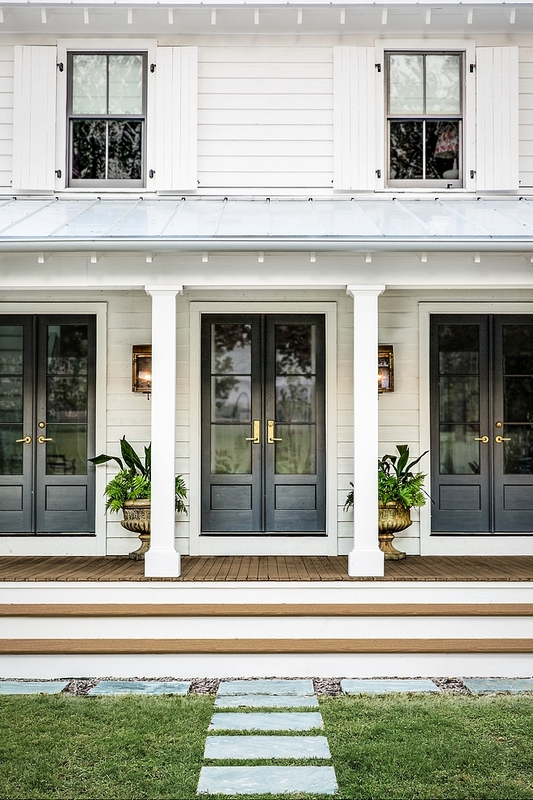 Similar French Doors Paint Color: Sherwin Williams Peppercorn SW 7674. 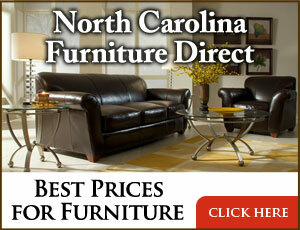 Gas Lights: Gas lanterns by Carolina Gas and Lanterns – similar here & here. Electrics: here, here & here. Beautiful Planters: Here, Here, Here & Here. 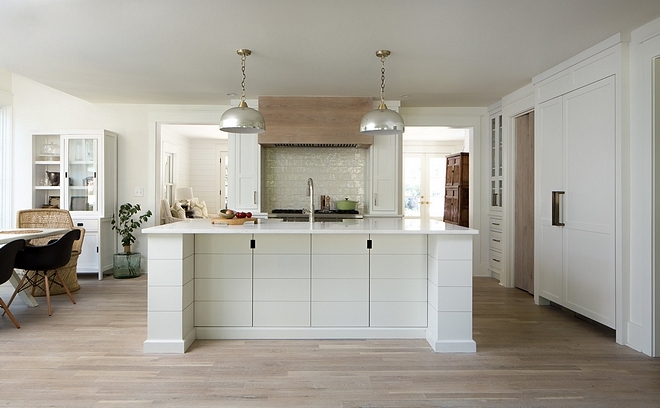 Kitchen cabinetry is custom with inset door and fridge panels. Kitchen island is also custom with shiplap. 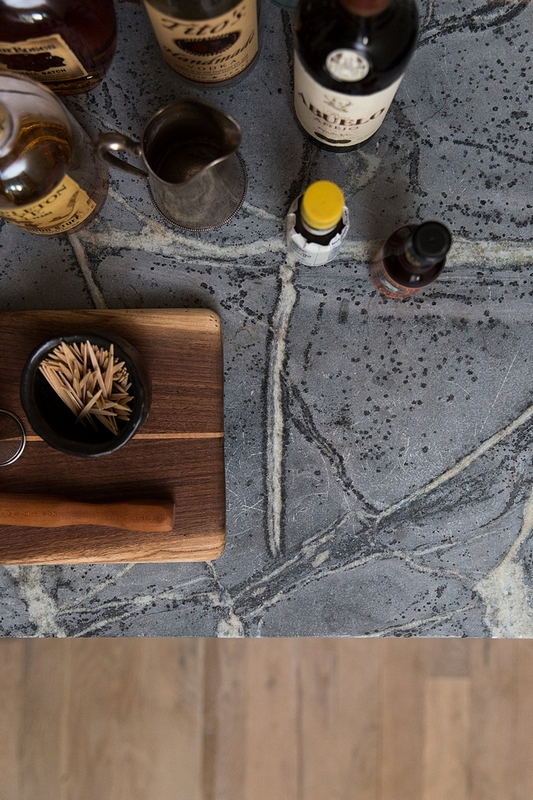 Kitchen Backsplash: Centura- Mallorca – Cream – similar here, here, here & here (in grey). Pendants: Ro Sham Beaux Edison Pendant – Affordable Pendants: here, here, here, here, here, here, here, here, here & here. 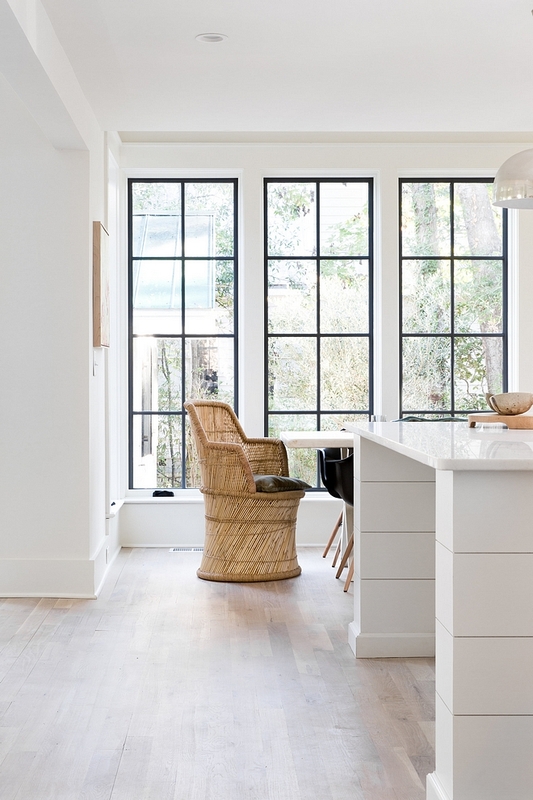 Designer Pendants: here, here, here, here, here, here, here & here. Countertop is Namib White Marble. 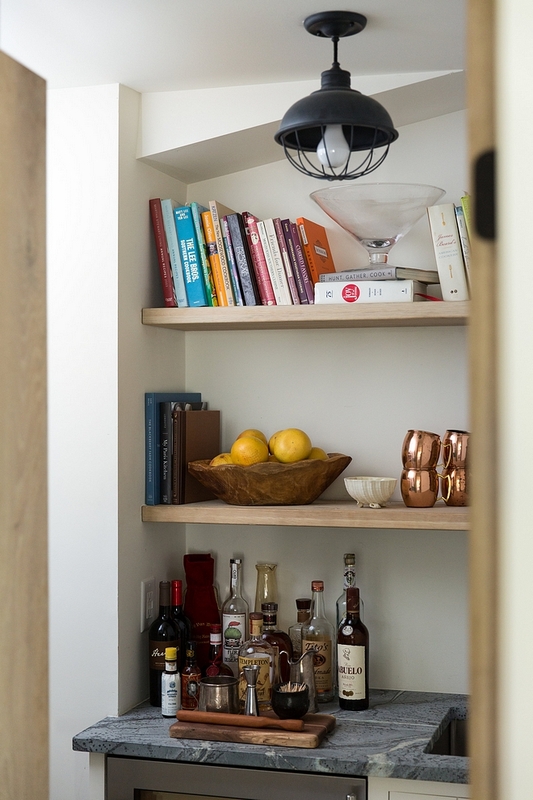 The pantry features custom vertical cabinetry and a White Oak door. 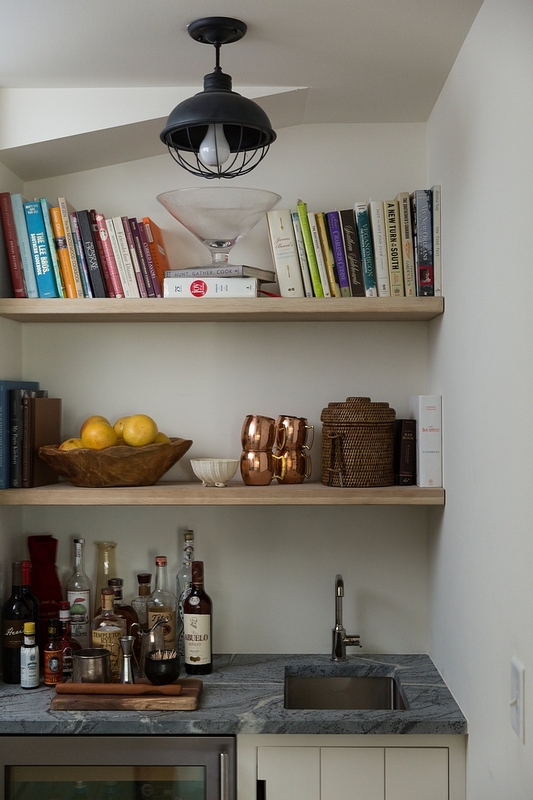 The pantry also features a coffee bar with White Oak shelves. Industrial Lighting: here, here, here, here, here, here, here, here & here. 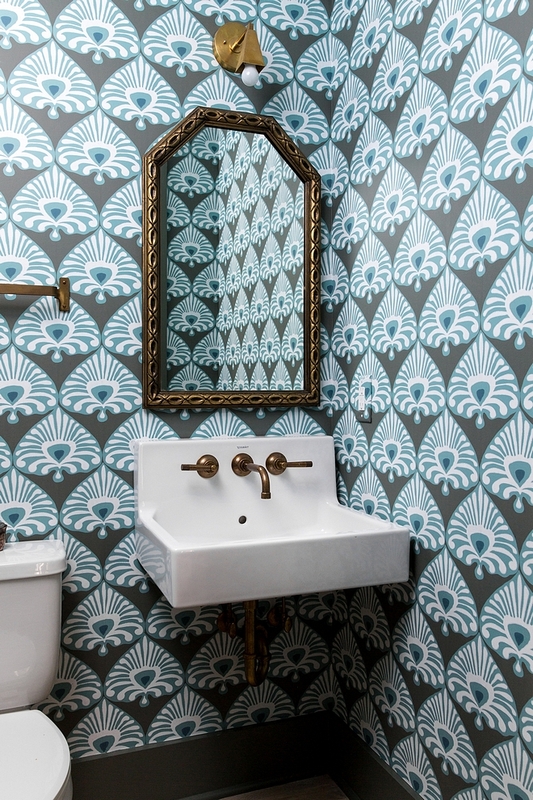 Bar Sink: Elkay – similar here. Rustic Wooden Bowls: here & here. 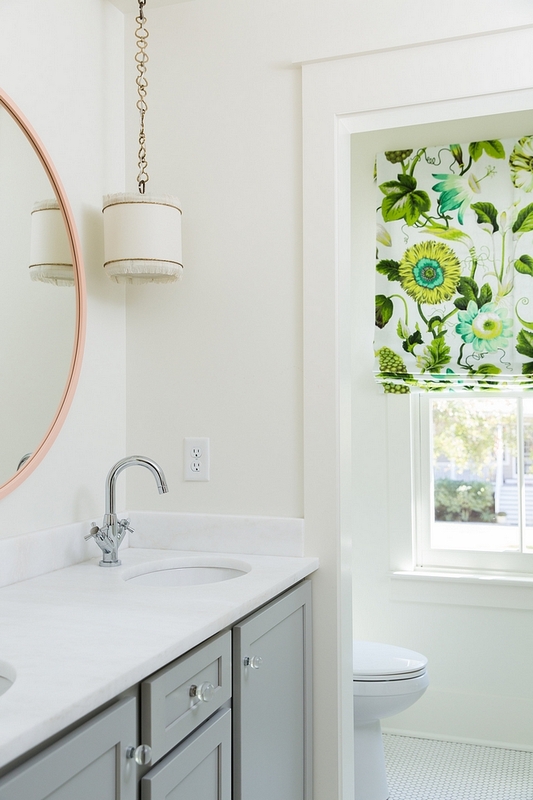 Faucet: Ammara – similar here. 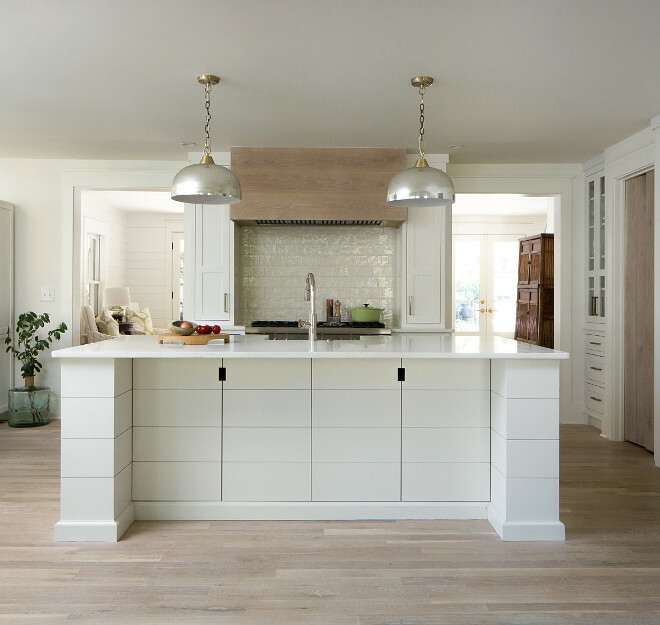 A sleek shiplap design was added to the kitchen island to bring a modern farmhouse look to this kitchen. Kitchen Faucet: Newport Brass Polished Nickel. 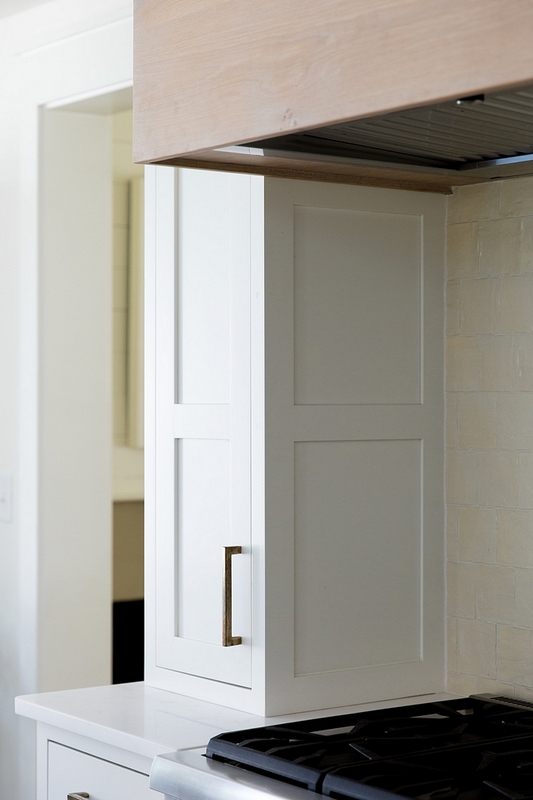 The custom vent hood is in White Oak with Rubio natural finish to match the hardwood floors. 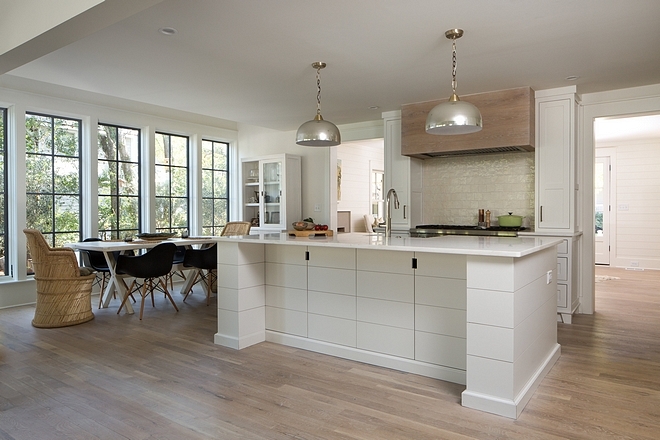 Cabinetry is by Eric Brooks Custom Woodworks on Sullivan’s Island. 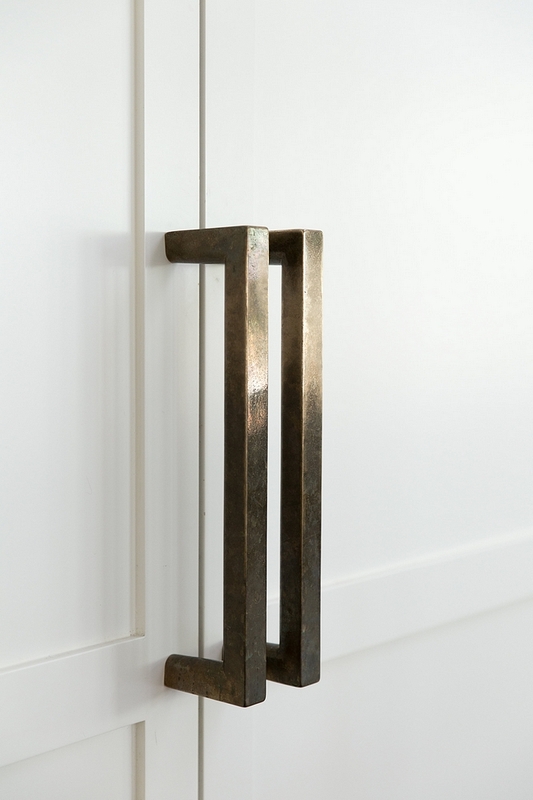 Kitchen pulls are Rocky Mountain Hardware in Bronze Light – similar here, here, here, here & here. 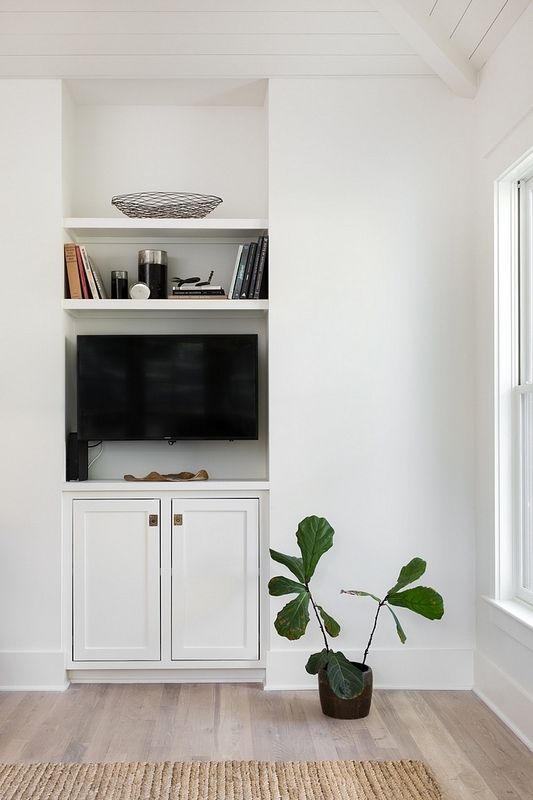 Island, trim and walls paint color is Benjamin Moore White Dove OC-17. 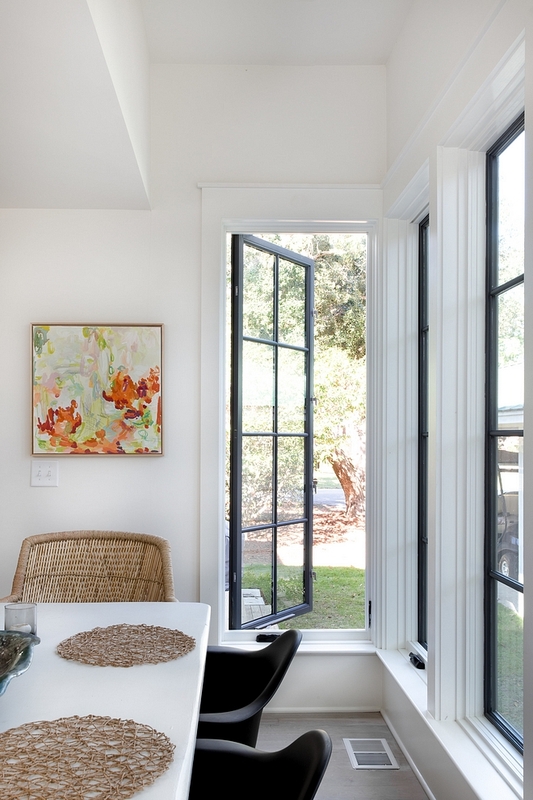 The breakfast room has a very casual feel and it’s perfect for family life. Similar host chairs can be found here. Hardwood flooring is 3” White Oak with a natural Rubio finish – similar (different sizes) here, here, here, here, here & here. 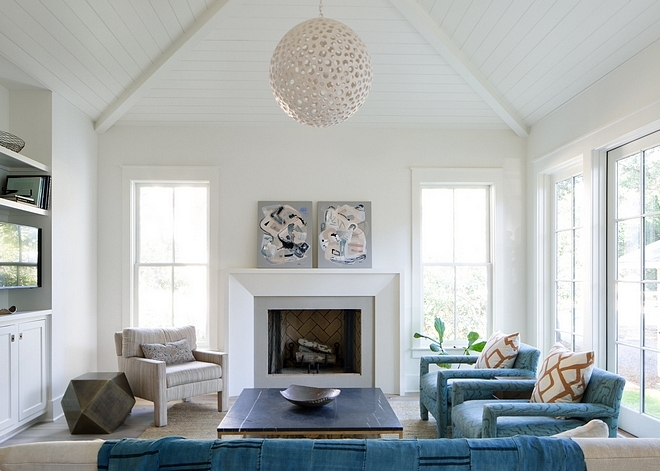 The living room features shiplap on vaulted ceiling. This dark charcoal, almost black, library feels moody, dramatic and it’s a great place to escape to with a good book. 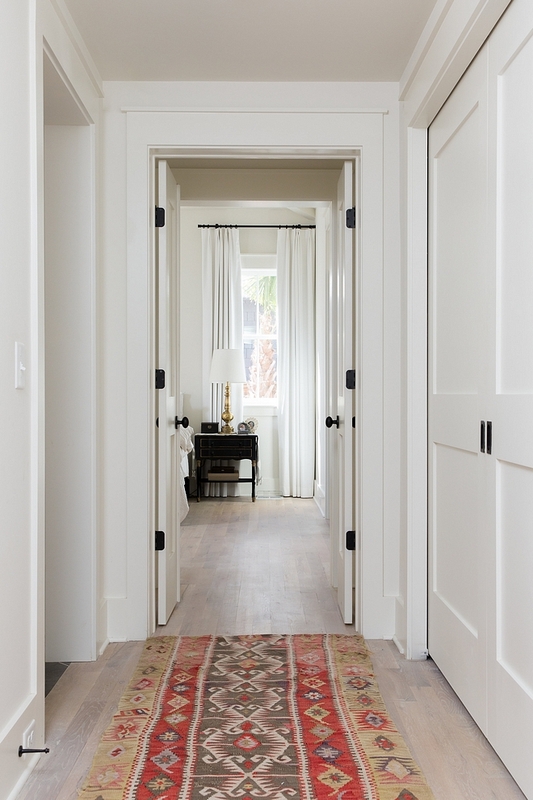 Library Walls + Trim + Ceiling Paint Color: Sherwin Williams Urbane Bronze (eggshell finish). Trim and door interior door color is a custom color to match the dark brown color in the wallpaper – similar to Benjamin Moore HC-168 Chelsea Gray. 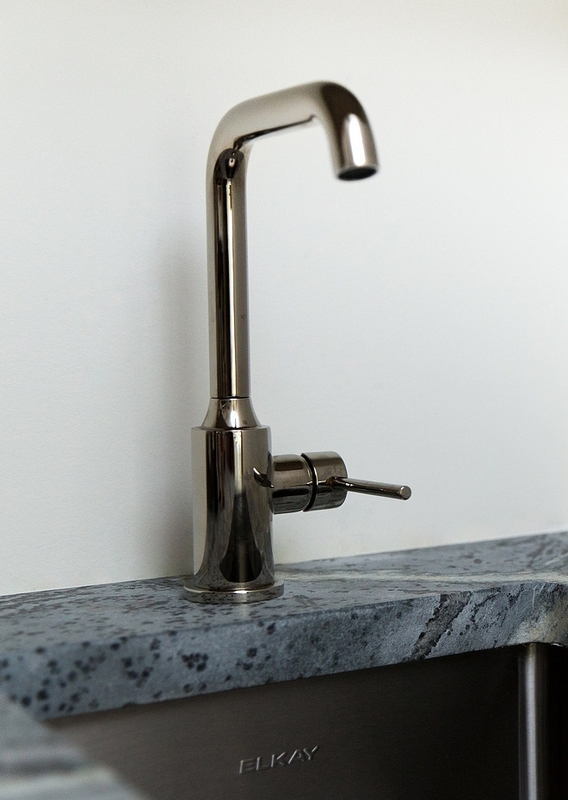 Sink & Faucet: Duravit floating sink with Rohl brass wall mount fixture. 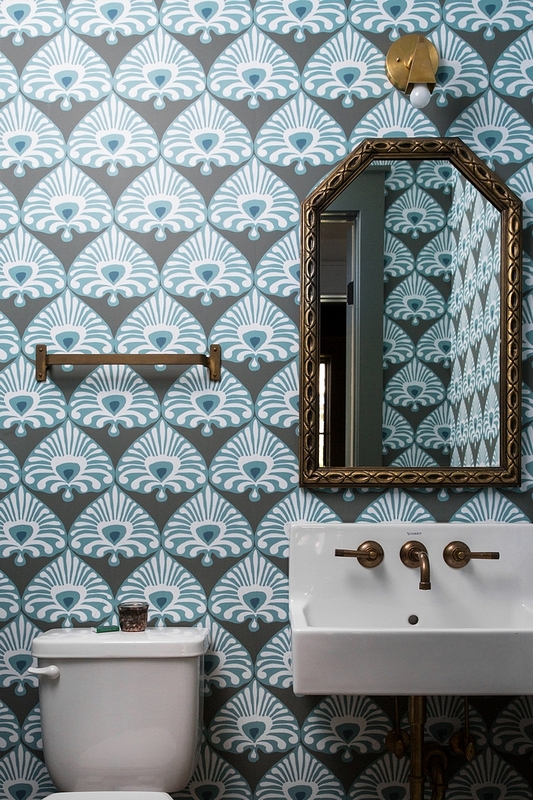 Wallpaper is by Serena and Lily. Paint color is Benjamin Moore OC-17 White Dove. 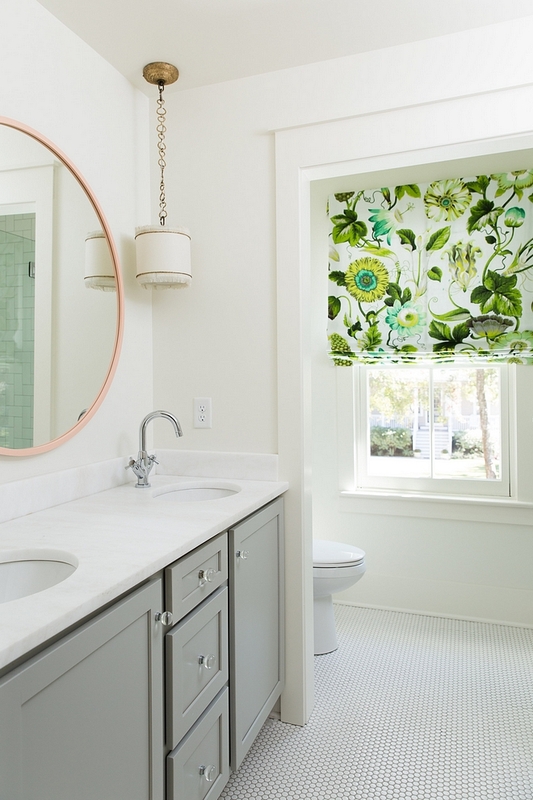 The bathroom cabinet is semi-custom inset cabinet from Advanced Kitchen and Design – similar color: Sherwin Williams Dorian Gray. Mirror is by Urban Outfitters – in Pink. 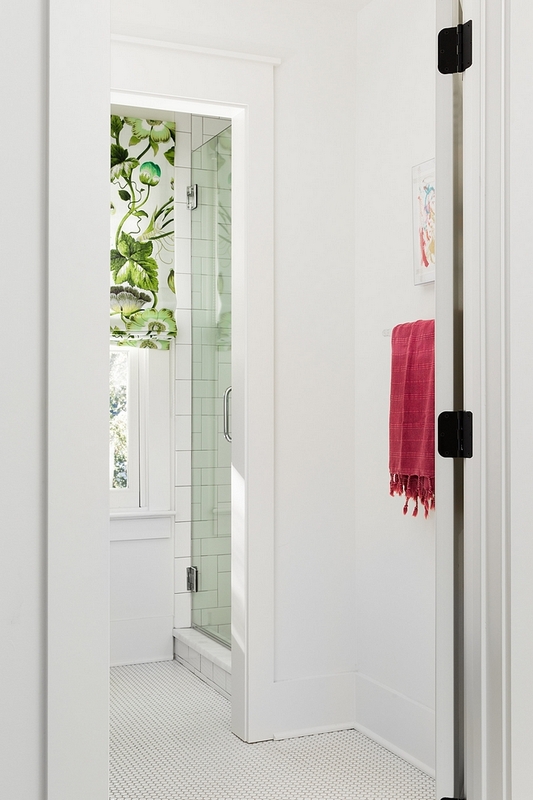 The kids bathroom features a separated shower, which is a great idea! 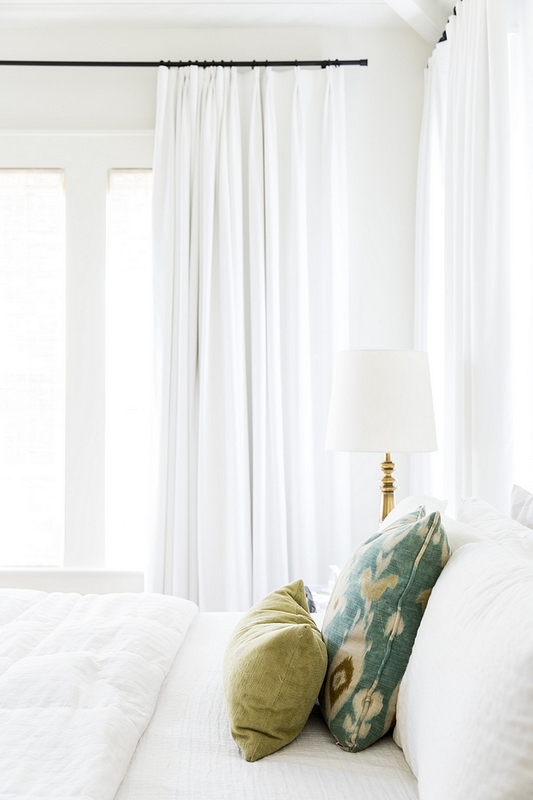 This is especially good if space is limited, and it’s also a budget-friendly alternative. 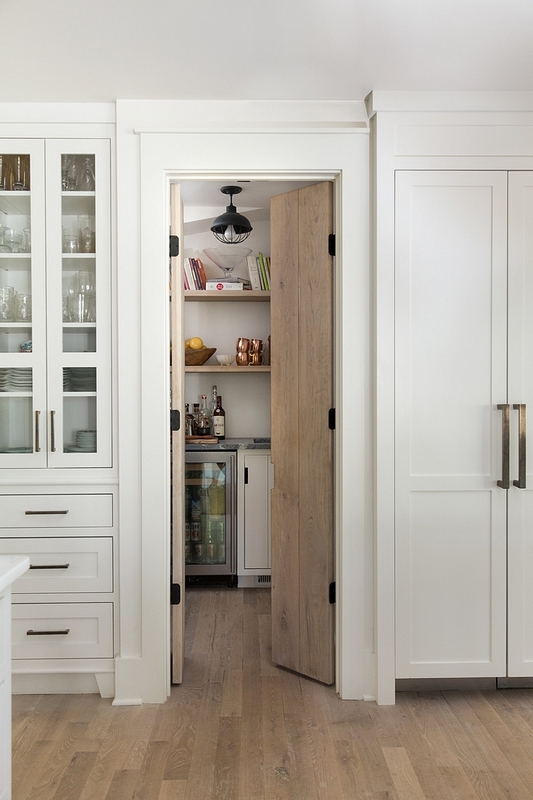 A pocket door can be added to bring privacy when needed. Keep this in mind if you’re building or renovating. Shower Wall Tile: White Subway in crosshatch pattern. 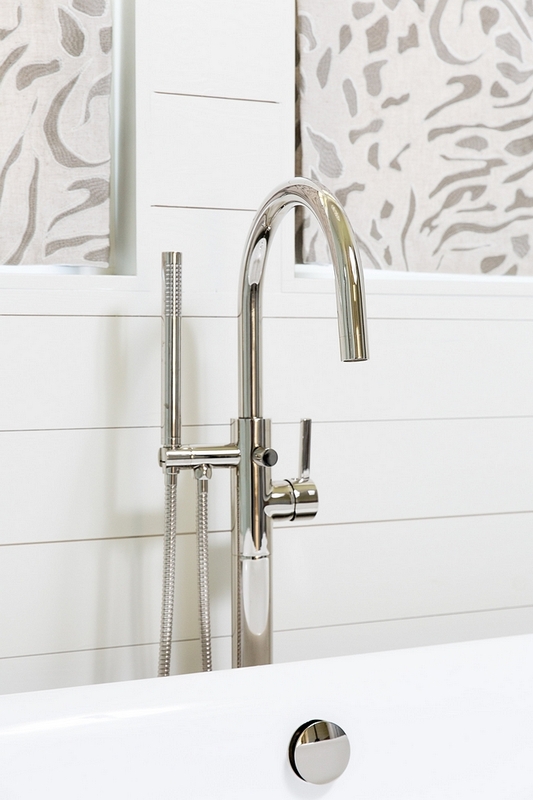 Faucet: Mirabelle milazzo in chrome. 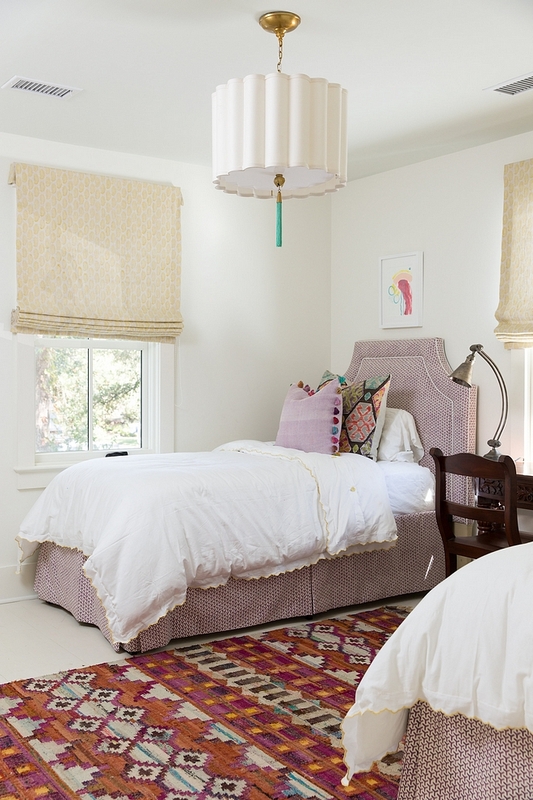 Chandelier light in kids bedroom is by Anthropologie. 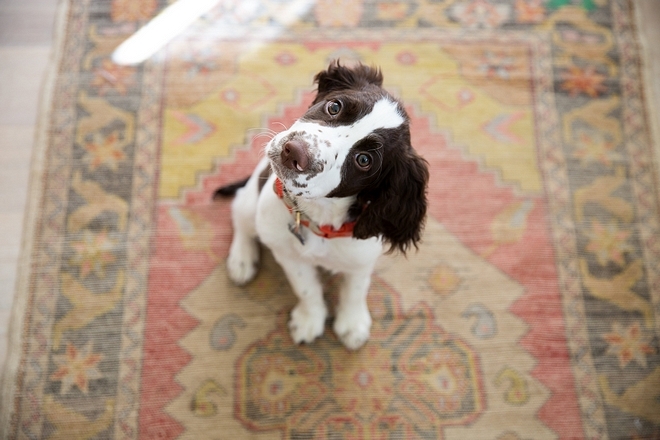 Similar Rug: Here, Here, Here, Here, Here, Here & Here. 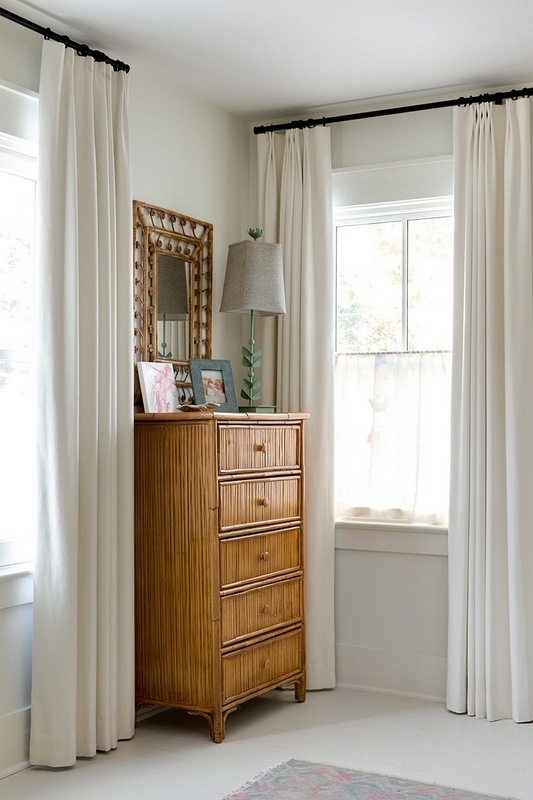 Similar Neutral Draperies: here, here, here, here, here & here. 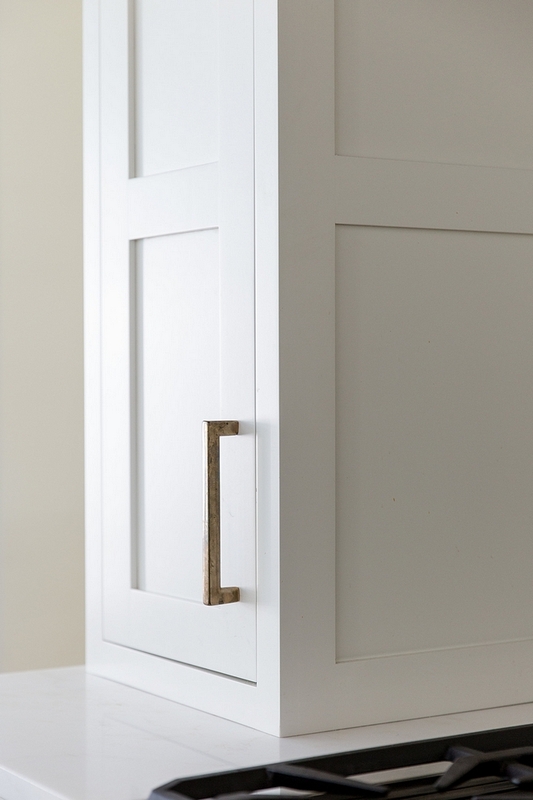 Interior Door Hardware – Ashley Norton. Runner: Vintage – similar here. 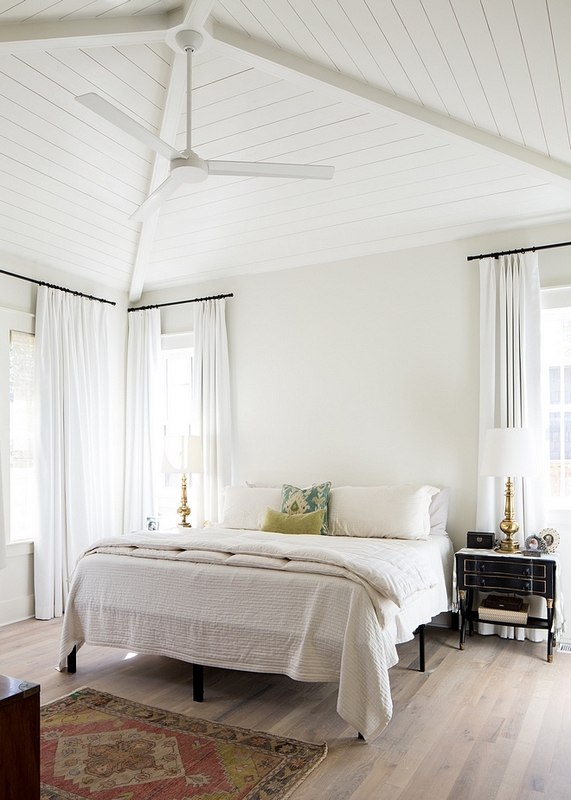 The master bedroom features vaulted ceiling with shiplap and off-white walls. 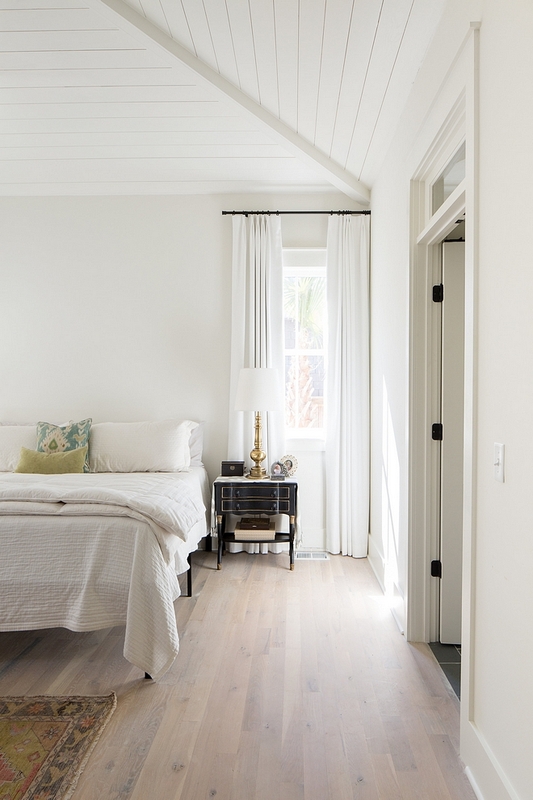 The master bedroom features the same 3” White Oak with a natural finish found in the main floor. 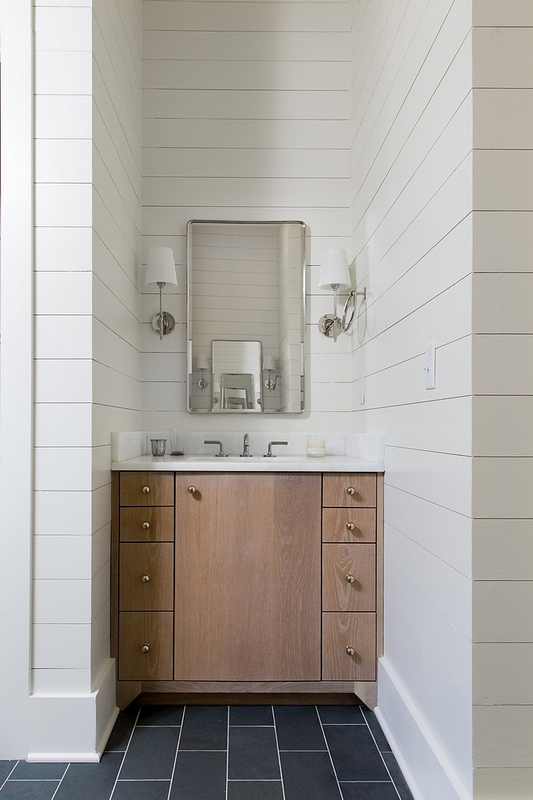 Gorgeous master bathroom with floor-to-ceiling shiplap paneling. Tub Fillers with Shower: here, here, here, here & here. Master Bathroom Cabinetry: Custom inset White Oak cabinets by Eric Brooks Custom Woodworks. Countertop is Namib white marble. 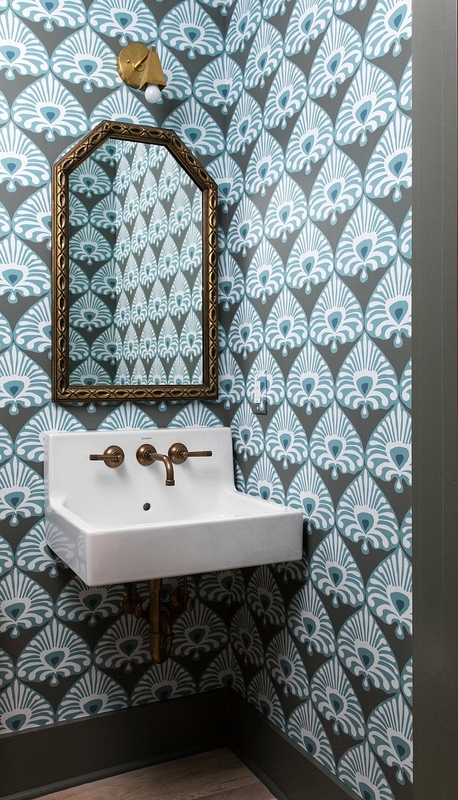 Faucet: Ammara – similar here & here. 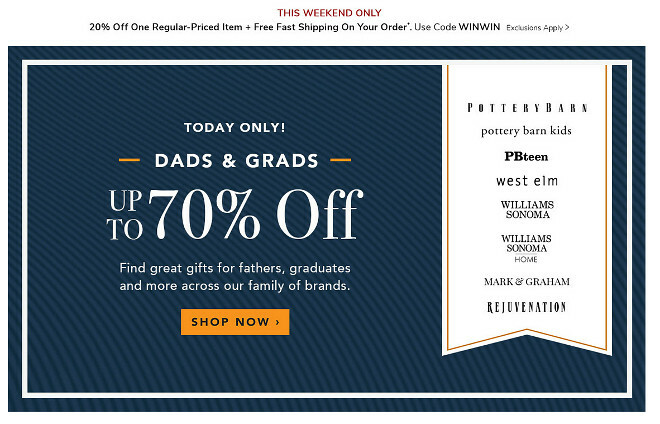 Medicine Cabinet Mirrors by Pottery Barn. 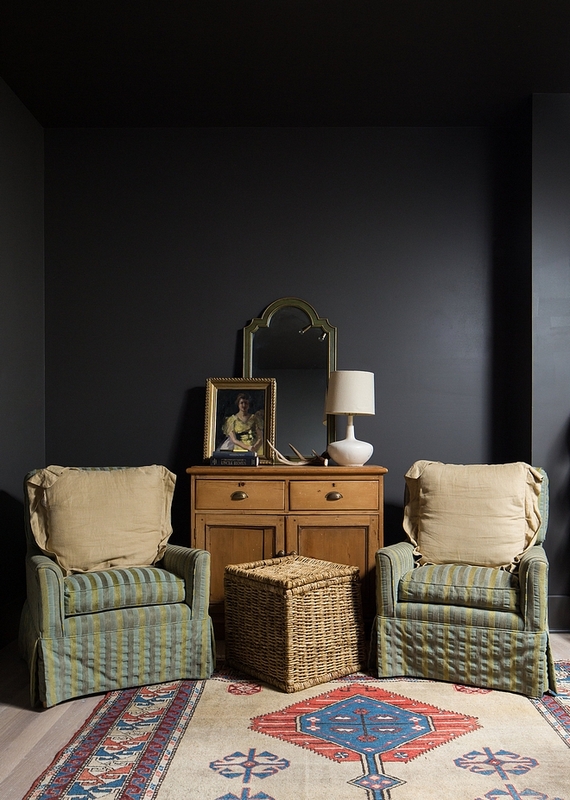 Flooring is 6×12 Squal grey slate tile laid in brick pattern – Similar here, here & here (great size for herringbone pattern). Master Bath Shower Floor: 2” marble hexagon tile. Master Bath Shower Wall Tile: White Subway. 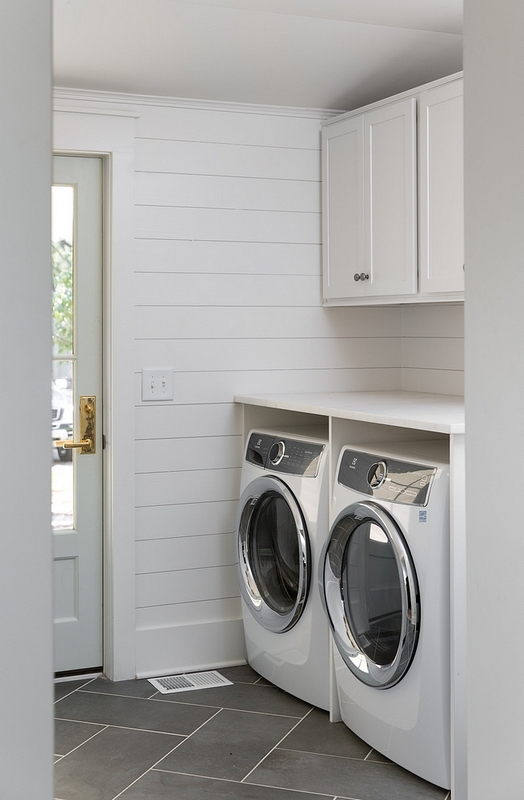 The laundry room also features white shiplap and a grey floor tile. 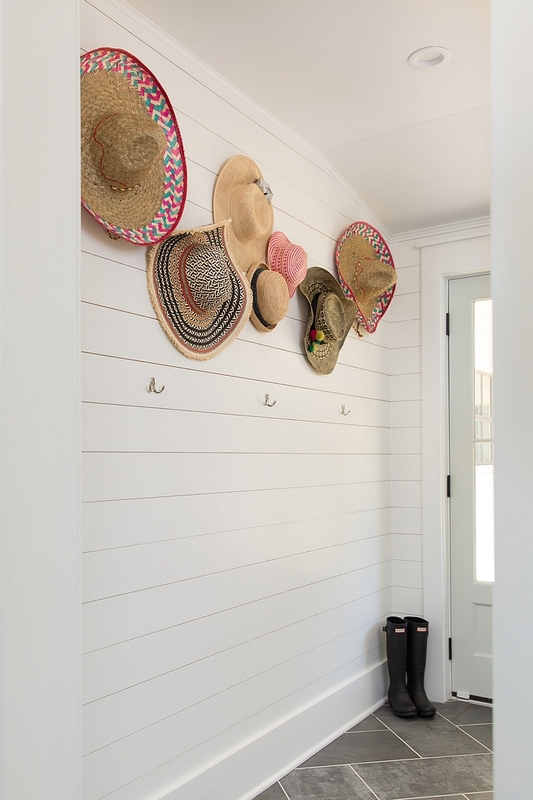 Mudroom features floor-to-ceiling shiplap painted in BM White Dove. 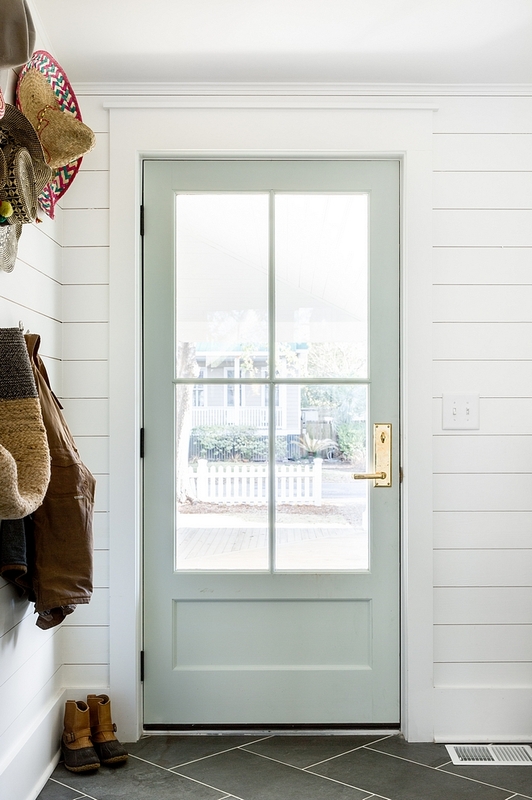 Mudroom door paint color is custom, similar to Benjamin Moore OC-52 Gray Owl. 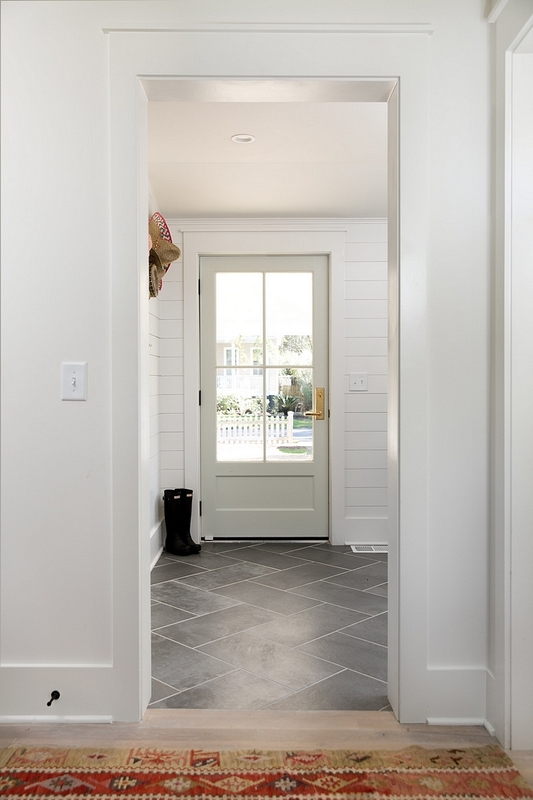 Mudroom Floor: 12x 24 Gotham Nero grey porcelain tile laid in herringbone pattern – similar here. 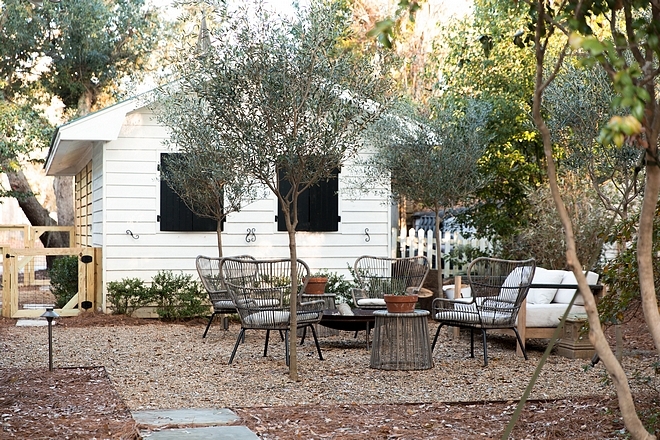 I am loving the rustic feel of this farmhouse backyard. 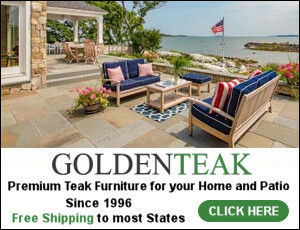 Beautful Outdoor Chairs: Here, Here, Here, Here, Here & Here. Similar Outdoor Sofa: Here, Here & Here. 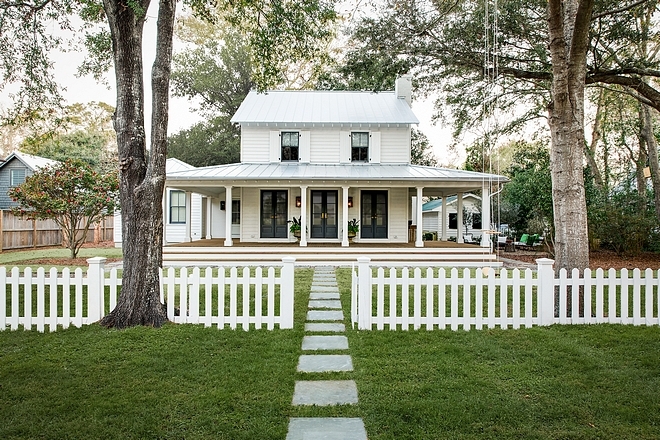 There’s plenty to love about this newly-renovated farmhouse and I really hope you had a great time touring it here! Builder: Barrow Building Group (Instagram). Photography: Minette Hand Photography (Instagram). Beautiful Homes of Instagram: New Construction.